This entry was posted in choice, fear, hope, Love on 19 July 2016 by Martina. 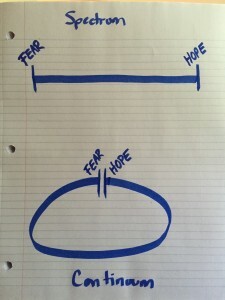 Last week I wrote about Hope being the antidote to Fear. But what is the antidote to Hope? I actually hadn’t thought about this, because I believe Hope is one of those things that is ever-present. Even in the worst circumstances, there seems to be hope. For years, I’ve written about how in the darkest moments you can still find that grain of sand that is Hope… somewhere… glimmering. I believe Hope is the most powerful energy in the Universe, because it’s the only thing that remains constant in even the most awful situations. 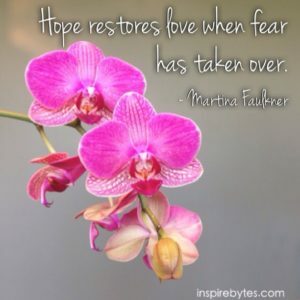 Hope restores Love when Fear has taken over. But does Hope have an Achilles heel? And if so, what is Hope’s kryptonite? I had to really think about this. Are apathy and indifference the poisons that kill Hope? I wanted to write about it on that day in order to really explore my thoughts and beliefs around the topic, but I didn’t. Instead, I allowed it to simmer on a back burner as I processed the depth of its simplicity. And then I wrote a totally different piece about my personal life and the struggle I have been facing with regard to my father’s stroke on its 10-year anniversary. (You can read it here.) That piece generated a lot of feedback, love, and support. More than I expected. But it wasn’t until I re-read it that I realized I had described the very scenario that I had simmering on a back burner. When resignation starts to take hold, hope starts to hibernate. Resignation, in my opinion, is a form of acceptance without choice. It’s forced. Perhaps because it’s forced, it becomes easier to adopt an attitude of indifference. In some ways, indifference can feel protective. But in other ways, it’s the indifference that opens the door to apathy. And yes, now that I’ve let it marinate for a while, I believe apathy is the antidote to Hope. I think if Hope were in a petri dish and you doused it with indifference, it would weaken, but not dissolve. However, as the indifference grows it becomes apathy, and apathy has the potential to neutralize Hope. Kill it? No. I don’t believe so, because I think Hope is the Tardigrade of the energy world. But arrest it and prevent it from fulfilling its potential? Yes. When we are in survival mode, Hope is more important than ever. This does not mean that we diminish and trivialize what’s going on around us by optimistically (blindly?) saying “Love will win” whenever tragedy hits. Rather, it means that we dig down deep into the nitty-gritty darkest recesses of our souls, knowing all the yuck and darkness, and still say: Love will win and then embody what that means. That’s Hope. That’s holding on to Hope, teaching Hope, speaking Hope, and living Hope. There’s a reason that at the bottom of Pandora’s Box, after all the fear, pestilence, and misery, Hope remained. Hope resides in the darkest places. Hope resides where we need it most, and the only thing that prevents us from accessing it is apathy … turning a blind eye and/or choosing not to care, because it simply hurts too much. For many of us it has been hurting too much lately. Tragedy, violence, and other senseless acts that go against our nature cause deep emotional wounds in our collective psyche. It’s in these moments that we get to choose how we want to move forward. We can choose Fear which eventually leads to a protective form of apathy, or we can choose Hope. Even when it’s hardest, especially when it’s hardest, I hope we choose Hope. P.S. If you’ve never heard/seen it before, here’s a great video by an old friend, Shawn Gallaway, on the choice of Love or Fear. May it inspire you. This entry was posted in fear, hope, Love, peace, Uncategorized on 8 July 2016 by Martina. To begin with, senseless tragedy and violence seem to be all around us. Our nervous systems are on overload, so even getting into a space where we could attempt to make sense of it all is virtually impossible. In the last week, we have seen violence on a horrific scale. Whether domestic or international, the crimes against humanity – against our very nature – have pushed many of us over the edge of reason and into empathic overload. I have seen many of my lightworker colleagues retreat in the last 24 hours, because of this. I myself, needed to take a step back to gain grounding and perspective in light of what has been going on. But please don’t mistake silence for apathy. In fact, it’s quite the reverse. During this time I have repeatedly asked myself what is the most important question to answer here? And I kept returning to: How do we make sense of the senseless? While, it’s not actually the most important question – it was the gateway to the most important answer. Firstly, we stop trying to make sense of the senseless. When something goes against our very nature, it is often explained away in order to soothe our ache. For example, when a child dies, we say: God must have needed him or her. We do this to create some sort of balm so we can categorize it and store it away and stem the tide of hurt and pain. When senseless violence occurs, we try to make the same attempt at understanding in order to diminish the pain and fear, but instead we often end up in a loop of emotion fueled by rationalization. We get trapped, because the very definition of the crime is that it’s senseless. Therefore, we need to stop trying to understand it, to stop trying to make sense of the senseless. The way forward is to name it and label it for what it is (senseless), so we can accept it as is and work to change at its roots, by understanding its genesis. All violence, in my opinion, has its origins in the energy of Fear, and Fear is taught. Whether it’s about power, frustration, lack, oppression, anger, rage, victimization, etc. – you name it, it’s taught, often through propaganda. These teachings are grounded in the low-vibration energy of Fear, and are then fueled until they manifest in action. In most of my studies thus far, I have been taught that the opposite of Fear is Love. And while I know that to be true (Love is the energy of creation, and Fear is the energy of destruction) – I actually modify it slightly. 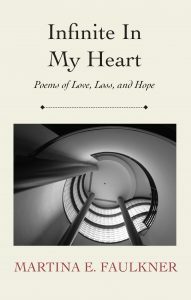 For years I have been writing and maintaining that the opposite of Fear is not Love, but Hope. Because in the absence of Love, and mired in the deepest trenches of Fear, Hope remains. It’s that glimmering grain of sand in the darkness that invites Love back into the conversation. Therefore, if we look at the vibrational energies on a spectrum, we would have Fear on one end (low vibration), and Hope on the other (high vibration). Anything that is of the lower vibrations associated with Fear (anger, hurt, betrayal, rage, etc.) would then be made better by dousing them with the higher vibration energies associated with Hope (Love, gratitude, compassion, kindness, etc.). However, I prefer to think of them as a continuum, rather than a spectrum. The reason being is that I know, personally and professionally, that Hope is always present, even in Fear. And it’s a much closer jump from Fear to Hope than it is from Fear to compassion, when it’s on a continuum. But what does all this have to do with the recent violence and tragedies around the world? What does this look like? Well, for my dear friends who are amazingly powerful and vocal activists, it means speaking out, raising awareness, and lending their voices to a cause. For my quieter more introspective friends, it means sharing Hope by adding beauty in to the world and reminding people that there is much – much – more good than violence and tragedy going on… and everything in between. These are just two examples, amid a world of infinite possibilities. We know that people listen when they feel heard. In order to even enter into a discussion to create change and foster peace, Hope needs to be restored. Teaching Hope, speaking Hope, and embodying Hope in our daily lives is the way forward for a more loving and peaceful world that is aligned with our true nature: our divinity and our humanity. We are both, and Hope resides exactly in the center of the two. Hope is the manifestation of what it means to be both human and divine. Hope is at the very core of who we are – and it’s the most powerful tool we have. 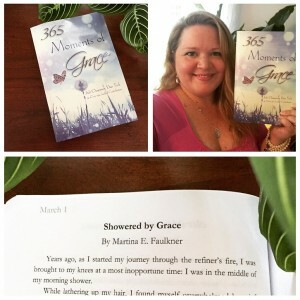 This entry was posted in abundance, gratitude, hope on 24 November 2015 by Martina. This week it’s Thanksgiving here in America. It’s a time to gather with friends and family and share food, laughter, and companionship. It’s a time to make new memories while reminiscing about old favorites. It’s a time to give thanks for all that we have. Gratitude, as a concept, is not new. In addition to Thanksgiving – a day set aside for giving thanks – we’ve been hearing about the practice of gratitude for years. However, gratitude seems to have gone mainstream when Oprah created a national endeavor to bring gratitude into our everyday lives through the gratitude journal. But what does gratitude do? Why do we practice giving thanks? What does it mean to be grateful? Somewhere early in my journey I learned a phrase: “Fear can’t live in a grateful heart.” When there was fear, the antidote was gratitude. If you read my post last week, you’ll know that I believe the antidote to fear is Hope, actually. So, where does gratitude come in? Well, Gratitude, in my opinion, is the action that represents Hope. It’s something active that we can do, that keeps fear at bay and invites Hope back into our lives, ultimately leading us back to Love. 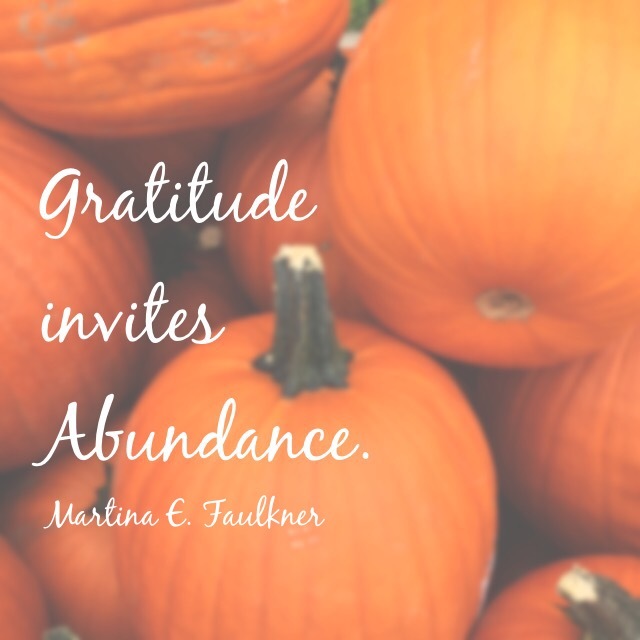 It seems to me, therefore, that Gratitude invites Abundance. Through the practice of expressing and truly feeling grateful for what we have, we are opening our hearts and our lives to more. More joy, more love, more peace, more hope…more abundance. So, this week especially, as we share our joy and give thanks for each other, for what we have, and for who we are, we invite gratitude into our hearts. In giving thanks, we are enacting Hope. Hope for the future. Hope for each other. Hope for the globe. Which leads me to ask: What if..? What if we practiced gratitude every day of the year? For my part, I am grateful for so many things, every single day, one of which is you. Thank you for joining me on this journey. Thank you for reading my words and sharing them. Thank you for showing up, being here, and for being you. This entry was posted in hope, Love, peace, searching for answers on 17 November 2015 by Martina. We all have them: Best laid plans. Then something unexpected happens and suddenly our plans have to change. Sometimes it’s for the better, sometimes less so. Last week I told you all that I was taking a mini-break from writing InspireBytes™ organically, on a weekly basis. I had several weeks of writing all planned out, prepared, and scheduled to carry us through Thanksgiving and beyond, which would allow me this hiatus. I’ve spent the better part of the last few days like most everyone else I know, waffling between anger, disbelief, frustration, and helplessness, with a thought cloud of question marks swirling above my head. What about all the survivors? What about those who died? Actually, it’s that last question that I felt like I could answer, because I know in my heart the only way forward is through hope. Even in the darkest of times, hope is what restores us to light. When Love has disappeared, it’s hope that keeps people moving forward. It’s hope that keeps a crack in the door to let Love back in. It seems to be a universally accepted truth that Love is the most powerful force in the universe, because it’s the source of all things. A couple months ago I even wrote about the 4 types of love, and I absolutely believe that Love is source. However, I don’t believe that Love is the most powerful force in the universe, because it shares that title… with hope. Hope is equally as powerful as Love for one main reason: Hope is the ever-present path back to love. It’s the grain of sand in the dark that reminds you that something else is possible. Think about it for a second: when things are at their worst, what keeps people going? What moves people forward through tragedy and trauma? Is it Love? Sometimes it’s love for family or others, but that’s not always the case – there’s something more. Even when someone is completely alone, trapped and isolated from everything, hope is present. When darkness, fear, and hatred are present and all feels lost and numb, it’s hope that restores Love. That’s why I can answer that last question: What next? Hope for the future. Hope for possibility. Hope for knowing that this era of terror will end. Hope for all that I believe and know to be true to come pouring forth and shift the energy around the trauma. Hope is the key that ignites possibility. And possibility is the first step toward change. In placing our energy in hope, we are taking a step toward defeating fear and terror by allowing for the possibility of Love to return. Hope restores Love. So, when we sit with question marks swirling over our heads and ask ourselves: What next? Look for the grain of sand in the dark – that pinhole of light we know as Hope – and focus on it. Pour your energy into it, whatever that means for you, and allow Love to return, edging fear out. 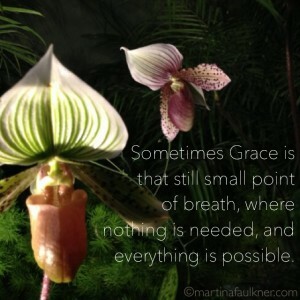 This entry was posted in fear, hope, Love, Uncategorized on 22 April 2014 by Martina. This holiday weekend got me thinking. Love is the answer to so many questions. So I thought it prudent to ask another question: Why Love? It seems a simple enough question, with an equally simple answer. Right? But let’s look at it from a different angle. And the list goes on and on…and on. Fear drives, loads up the bus, and picks up more passengers as it goes, constantly edging love out. But here’s the good news: Somewhere on the bus, perhaps in the last seat, pressed against the window, searching the passing scenery for inspiration is a passenger that never leaves. It’s a passenger that is on every bus, everywhere, all the time. Eventually it makes its way to the front of the bus and slowly redirects fear to the stop where love can get on board once more. Hope is the often silent, but ever-present passenger on the journey. Thankfully, hope never remains silent for long. Hope restores love when fear has taken over.